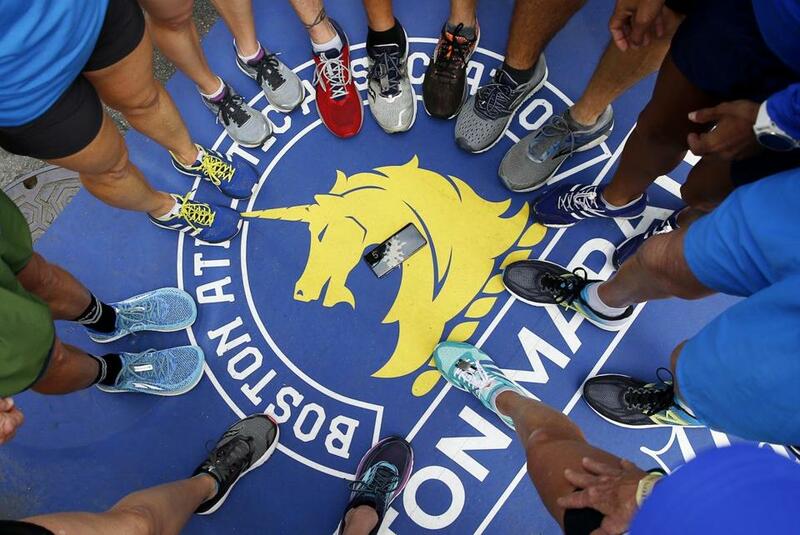 Members of the Florida Forerunners place their feet in a circle on the Boston Marathon finish line Sunday. The St. Petersburg running group will take on the Marathon on Monday. The Boston Marathon’s finish line area was packed Sunday with runners and supporters from around the world. Runners in matching brightly colored tracksuits chatted with each other along the Boylston Street finish line while teams posed for photos. More than 30,000 runners are expected to hit the road Monday for the 123rd Boston Marathon, leaving from the Hopkinton starting line at staggered times beginning at 9 a.m. The runners will likely have wet conditions as rain is expected to begin overnight Sunday and fall on and off until around 9 p.m. Monday. But on Sunday some runners said they refused to let the rain put a damper on the race. For many competitors, this will be their debut participating in the world-renowned event. Nathaniel Lau, 27, and his running club traveled to Boston from Hong Kong to compete in the marathon for the first time. “We’re all excited despite our jet lag,” Lau smiled as he and his teammates posed for a 360-degree photo at the finish line. Lau said he has run marathons in Hong Kong, but he’s looking forward to the energy and excitement that Boston crowds bring to the sidelines. Although Travis has been competing in triathlons for 13 years, he only began marathon training a year and a half ago. Travis said he has especially enjoyed getting to know the other members of his group, which consists of members of the Canadian military. “It’s a chance to get to know like-minded people that are also excited to be here and the energy is high,” Travis said. Several athletes said they value running with a team. Deborah Lazaroff, 63, of Jackson, Mich., will be running in the Boston Marathon for the 18th time and she said she’s excited to be participating with her team, called Black Sheep Run. Several members of Black Sheep Run will be running the Boston Marathon for the first time, Lazaroff said. Jetola Anderson-Blair, 57, who lives in Houston, has run the Boston Marathon before but she said this year is especially significant for her. She will be running with the National Black Marathon Association in its first year competing in Boston.